Iki haftadir temizlemeye, organize etmeye ve derleyip toplamaya calistigim studyomun kukla alaniyla yapmak istedim acilisi. Sag ust raftaki kutularda eski filmlerin kuklalari ve setleri var. Bazilarinda minyatur/prop yapma malzemeleri var. Alttaki rafta sol tarafta dugmeydi ipti filan gibi disik malzemeleri ve minyatur dekorasyon malzemeleri var. Sagda da taki, incik boncuk. En alt rafta ise firin ve dikis malzemleriyle boncuklar duruyor. Masadaki mini cekmecelerde de envai cesit ivir zivir: iplikler, kurdeleler, igneler, kukla taki malzemeleri, kukla kiyafet susleri, dugmeler, cirt cirtlar, gozler... Hatta belki ilerleyen haftalarda cekmeceliklerin iclerini de paylasirim. Hello there! 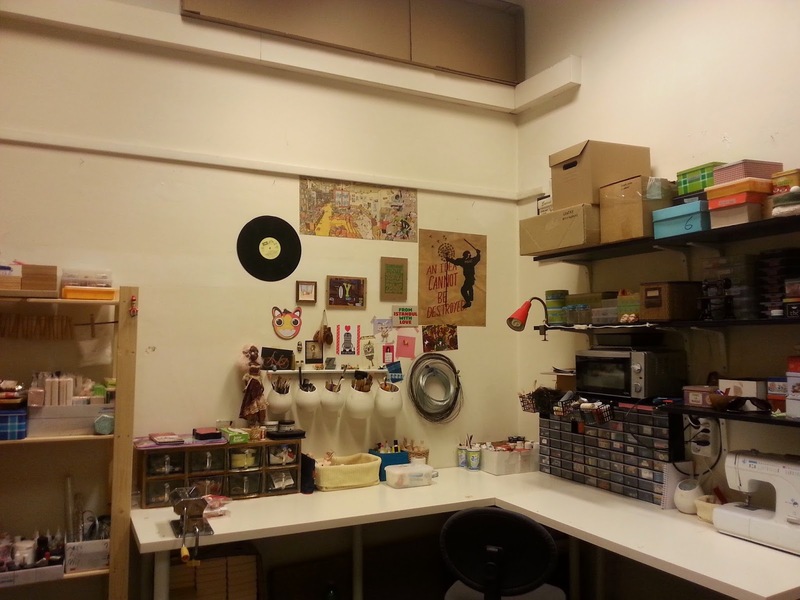 Since I realized how I enjoyed seeing other artists' studios and work spaces, I decided to share a photo from my studio every Wednesday from now on. (It happened to be on a Thursday this time, sorry for that. But I'm on time on instagram ^_^) I find it very inspiring to see how they choose to organize their spaces, the tools they're using, what they're working on and how they're working on it, etc. Also, I haven't shared any photos of my workspace since I moved to my new studio and I thought this would be the best motivation for me to keep the studio clean / organized and this blog alive. I hope you'll enjoy it too! I wanted to start with the doll section of my studio, which I've been trying to clean and organize for the last two weeks. On the top right shelf, in the boxes there are props and puppets from my old films as well as miniature/prop making materials. Below on the left are the buttons and strings and some miniature decoration elements (filigrees and such) and on the left are jewelry making stuff. On the bottom shelf, sits my oven next to the sewing materials like zippers and beads. In the tiny drawers on the table, I've got all kinds of itty bitty doll making stuff like eyes, buttons, jewelry, eyelets, trims, ribbons, threads... I might even share insides of the shelf-lings on the following weeks.